Hotel Overview Kaliakra Palace is a brand-new hotel, built in the year 2000. All bedrooms are elegantly furnished with a balcony, private shower, a hairdryer, a telephone, a Satellite TV, music and a mini bar. There is a specially designed children playground. 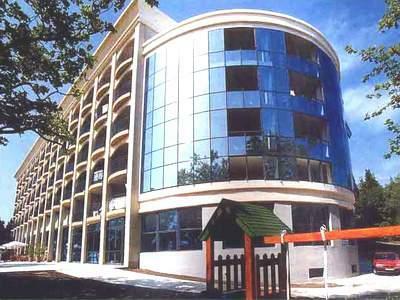 Kaliakra Palace hotel has got an indoor and an outdoor swimming pools and a sauna. There is a Sky Bar with a lovely panoramic view of the resort. don't go to kaliakra.Romanian tourists are looked like monkeys, they treat us like monkey.tehy put our car under the garbage and force us to pay 12 leva/ day for staying in garbage.th emanager look us wiht hate, talk us like emigrants.we pay for services but they treat us like slaves. We were in this hotel in the end of august- me, wife and sun.Firs of all -very bad parking place- a lot of a cars and no place. the room was with broken door and air conditioner. we tried to change the room but the answer was -hotel is full and no more rooms. I tried to speak with manager- no chiefs for next 3 days. OK.Next 5 days nobody cleans room.The food-my son had vomiting and diarea, the hotel doctor- woman, said that she can do nothing to change the situation. Our vocation were bad,the money spent are lost and i will never go to this place anymore and not recommend to anybody.No this hotel, no this country. The staff is not so nice. "Service with a smile" is a joke there. Cleaning lady came every day, but we had to ask several times for TP or soap, as she forgot to supply them (we stayed 12 days). After a week, I went to the reception to ask how often they change the sheets. they say every day - of course not in our room, I had the same used (i mean with holes!!!) sheet for a week. And the cleaning lady smelled like BO from 10 meters. I wouldn't choose this hotel again. the rooms with view behind the hotel had awful view+ very bad smell from the kitchen. i dont know who gave them 4 stars-not reccomended as holiday place! i was in kaliakra palace this year (june 2008). i am falling in love whit kaliakra palace and i am falling in love whit a russian boy who come there whit a little blond child. if he seeing this comment ...please give me a note at this site. thank you kalikra palace for give me this opportunity! -no heat ,no cold water in the room,our child went ill.
-very little restaurant.It is very difficult to find a place to eat. -everything is dirty .You have to look carefully for a proper plate or fork. -the parking of the hotel is totally inadequate.We parked the car far away from the hotel because we did not find any place. -the pool is a joke and dirty. -every body smokes every where.The whole place is full of cigarette smoke. This place doesn't deserve more than 1 star. Disorganised shambles,the restaurant in particular is worst that Ive seen in forty years of holidays in the Med. An example ! Pick up sugar in a very very large tablespoon, collect tea bag, and then proceed in que to both Tea/coffee and juices,at this point pick up cups (sorry)wait for cups they only supply eight at a time and then only intermittently,select juice hard luck if you only want coffee for as with the cups ,so with the glass,s and you are stuck until another problem is solved,guess what we have now arrived at the saucers and yes same problem and then finally to the tea and coffee dispensers. Same goes for toast/cereals,and tables yes they are cleared but invariably not until all guests have left the particular tables,if the manageress arrives see looks intently at the problem and she too disapears. In the section that we used there were eighteen tables, during the week the best count for condiments three, the average one set only. And that is only the food commented on. Just arrived back on 25 August 2006. If you want to lose weight this Hotel ok. Only caters for the Germans. Food worse than disgusting so we had to spend most of our spending money on eating out. Pool must be the worst on the resort. Rooms adequate and staff friendly. We are a mixed black and white family and was seen as a side show by the Germans and most other nationalities in the Hotel - not recommended for touchy "black" people. Bulgaria lovely Country but Golden Sands a bit like Blackpool in the sun found it quite tacky. Very clean and safe for both adults and children but will not be returning. Rooms: adequate but fairly basic. Beds clean, towels changed daily. Showers are a 'Bulgarian' experience! Reception: 24 hours, friendly, helpful, money exchange facility. Bar: first class service, large beer - 2 lev, small beer - 1.5 lev. Restaurant: breakfast is typical buffet but good (boiled eggs generally hard & cold), fried eggs & ommelets are freshly cooked. System needs reorganising to cut out conjestion. Evening meal is typical buffet, reasonable variety but service deteriorates after 8pm. Pool: poor, cramped for space. Resort of Golden Sands: southern end expensive (large beer 3.5 lev), cheaper towards the north. Get beyond the harbour to find beach shack restaurants serving good food at cheap rates (large beer 1 lev).